People are always asking me how they can learn about graphic design and photography or make better visuals, etc. The first step, I answer, is just to look around you and really see what there is to see. You can learn a lot, I tell them, by really taking the time to see and examine the visuals around you. Design is everywhere. Even non-designers can learn a lot by simply opening their eyes and observing the works of professionals. You just never know where inspiration or good examples will turn up. Sometimes, even a TV commercial or two can demonstrate just what it is that makes visuals effective and powerful. The New Zealand and Australian tourism TV commercials are fantastic examples of the power of visuals. They've been airing on Japan's cable networks for quite some time, especially the spot from New Zealand. Both the New Zealand Travel and Australia Tourism website are great places to catch these videos too. Both sites are well done. Visuals that surprise people, touch them, delight them, and support your story are best because they affect people in an emotional way. People are more likely to remember your content in the form of stories and examples, and they are also more likely to remember your content if your visuals are unique, powerful and of the highest quality. Yes, a 60-second TV spot promoting tourism is quite different from a 30-minute live conference presentation. I am not suggesting they are the same. But the 60-second TV commercial is a presentation, and most of them are utterly unremarkable and forgettable. The lesson I get from watching these two promotional video "presentations" from Down Under is simply this: If you are going to use visuals, then for crying out loud, make them insanely great visuals. Watch these videos a couple of times and ask yourself which one is more memorable. Which one is more effective in telling a story and making a pitch? For TV spots to be effective they need to run a lot. We need to be exposed over and over. In that context, then, which one works better? Both videos are very well done and will prove to be effective. 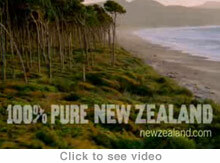 But I particularly like the New Zealand commercial simply because no words are spoken at all. There are a couple of advantages to this. For example, the NZ video is ready as is for most markets with no translation needed. In Japan, the Australia video has translation on screen adding noise to the screen visually. Nonetheless, the "Where the bloody hell are you?" spot does capture the brand perfectly, and perhaps the spoken word was necessary to pull that off. Both make great use of the visual element. What makes some images so powerful and others unremarkable? One of the first lessons visual artists and designers learn early is the basics of composition, including the rule of thirds and the Golden mean, etc. I'll focus on the rule of thirds as it is the easiest to apply (I introduced this in a previous post as well). The "rule of thirds" says that images (video scenes, etc.) may appear more interesting, engaging, dynamic, compelling, etc. if the subject is not placed in the center. Of course dead center is where beginning photographers or novice videographers tend to put their subject. If you try moving your subject away from the center, however, perhaps nearer to one of what are called "power points" (where the grid lines intersect), you can create a more powerful or interesting visual by creating a bit of tension or even drama. Try experimenting with this. In the case of the tourism commercials, notice when you watch how many scenes are shot with the subject outside the middle of the frame (at least at the beginning of the scene). If you were to freeze many of the frames you would notice that the subject is often near one of the "power points" or placed far from center. To show this I've placed a grid over a few screenshots from both commercials below. This is a simple thing, but it is one of those very basic things that the pros do so well. We too can design better visuals — take better snaps, shoot better video, etc. -— by keeping the principles such as the rule of thirds in mind. The "rule" is not a rule at all but a simple guideline. And while it's important to understand, the rule of thirds is by no means a panacea for poor design, but is simply one more principle for you to be aware of as you strive to improve your own design mindfulness. Screenshots from "Where the Bloody Hell are You? Above: Notice how many of the subjects are aligned vertically along a "power point" or in the outer or lower third. In the shot featuring the boy (top left), you can see that two walls in the background follow the horizontal lines of the upper and lower thirds. In the shots with the pilot and the waiter you'll notice how the horizon follows along one of the horizontal lines. Screenshots from "100% Pure New Zealand"
Stills from the 100% Pure New Zealand commercial. Placing the subject in the outer third can give a visual more tension and drama and attract you into the scene. For the next few days try to pay attention to posters, billboards, etc. Or watch a film and notice how scenes are shot to create mood and tension. Above:The example slide above I made in PowerPoint quickly using an iStockphoto image. 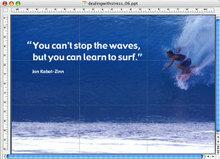 I created a "Rule of Thirds" grid by manipulating the Guides in the Master slide. The text rests directly on the upper third horizontal line; the line extends through the surfers midsection. A viewer would notice the surfer first and be carried immediately with the implied motion toward the text along the horizontal line near the upper left "power point," typically a strong focal point in a slide. • Several articles on photography and the Golden Mean. • Golden mean to rule of thirds (Presentation Zen). • Rule of Thirds (Silverlight.co.uk).